Snow. During my very first snowstorm, I thought snow was sort of fun. When this snow kept on going for you know, a couple of more months, that ‘fun’ part quickly faded away. It’s not really the snow amount that bothers me tho: it’s the fact that the snow keeps hanging around for a while because of the subzero temperatures. Seasonal awareness. You can literally feel and smell the seasonal changes: I’ve never really paid attention to this when I lived in Europe. The dramatic difference in fauna and wildlife. Seeing deer walk around surprised me. But raccouns, skunks, groundhogs, coyotes? Not to mention, the difference in birds: hummingbirds, cardinals and robins (“giant robins”) absolutely make up for the little birds I’ve seen and gotten used to in Europe. I remember the very first day I saw a Bluejay fly about and I was too stunned to figure out what I just had seen as I couldn’t properly name the bird. I wonder if that’s the same feeling the very first North American explorers had when they set foot on this continent. This entry was posted in xsamplex and tagged Canada, fauna, snowstorms on November 20, 2011 by Arthur. I used to play chess in school competitions, from age 9 or 10-ish to (effectively) 19. I was fairly good: At one time, I ended up in the finals (after a mind-blowing 100% winning streak) where I gave up a winning game after I found out I was going to miss the train back home (earlier on xsamplex, 3 years ago). Anyhow: before computing became big, I ended up buying two chess “computers”: one was a TravelMate (Saitek?) and the second one was the Scisys Turbo 16K (“endorsed by Gary Gasparov”). Why do I mention all of this? I just saw ‘Bobby Fisher against the world”, a documentary about the tragic life of chess grandmaster and world champion, Bobby Fisher. I followed the 1992 Spassky rematch and from what I recall, it was indeed a match that should have never been played. While a lot of people of my generation had Fisher as their primary chess champion, my personal favourite chess player was Garry Kasparov. I don’t agree with Kasparov’s political aspirations, but as a chess player he promoted aggressive and solid gameplay without the theatrics and antics of his predecessors. I still do play chess so once in a while, mostly against the computer using any of the current known free chess engines: It’s amazing how the technology to write chess computers has advanced into the current state. No, let me rephrase that: with the current technology’s pace, chess engines have become so good, that they can outplay and outrank grandmasters. This is an amazing feat. Whether that’s good or not, I’ll leave to the current generation of chess grandmasters. This entry was posted in xsamplex and tagged Bobby Fisher, chess, computing, Gary Kasparov on June 27, 2011 by Arthur. I briefly mentioned this in the previous posting that I bought myself an Android tablet, which review is pending… I hope. Thanks to this tablet, I’ve actually re-kindled (no really, considering I use the Android Kindle app) my love for reading books. I think the current score of books I finish in a week is four. This reminds me when I was younger and introduced to the library by parents and siblings: I (and my twin sibling) literally swallowed (or ate so you will) books and eventually we were reminded by others what the point was visit to the (local) library branch on a daily basis. This amused our parents who laughed about this and mockingly called the library our ‘second home’. There are couple of ‘library events’ that stand firmly in the back of my mind: the first one was the day we as (children) decided to try to walk out with books that were marked as ‘more adult’ (age 12 and higher). We were bored to tears reading the kids books but the librarian on duty caught us red-handed. The second event was our entrance in the city’s Central Library: it was so large, and there were so many books to pick from. I mostly read a mix of SF/Fantasy, Thrillers and literature: compared to the little local library, the Central Library was a place in heaven, with places to roam about and quietly sit down. I might add, that this Central Library had plenty of programming books around and (unsurprisingly) would fuel our search for programming subjects. This entry was posted in xsamplex and tagged A500, books, Iconia Tab, library on June 18, 2011 by Arthur. Sony has shipped the last cassette tape Walkmans to vendors (Crunchgear), according to multiple media outlets. It’s surprising that the Walkman was produced for this long: the very first Sony Walkman appeared in 1979 and was an instant hit. In today’s portable electronic devices market, Sony is sadly not a leading company anymore. In the early 80s, I walked around with (non)-Sony portable cassette players: I think the only time I actually bought a Sony was a few years before I left for Canada, a thing I regretted instantly as I had already been moving to MD players. My very first ‘Walkman’ was an Erres (rather an Erres-branded Phillips thing): I’m not sure how much it cost those days or how I got the money to buy one. I think right after the Erres, I jumped on the Aiwa bandwagon: the very first one I bought was the one shown above. I didn’t know that Aiwa’s largest shareholder was Sony: In the early 2000s, Aiwa slowly slid to bankruptcy and was eventually bought up by Sony. Anyway, there were good memories of having a walkman: one of them is that even back in the 80s news outlets reported that ‘more and more teenagers were getting deaf because of the use of walkmans’. They say that these days of iPods and MP3 players also. If you play loud music, of course you’re susceptible to getting deaf, but it seems that the media sometimes just sound like moral preachers stuck in repeating the same story every 10 years. This entry was posted in xsamplex and tagged Aiwa, cassette, Sony, Walkman on October 24, 2010 by Arthur. E arlier this weekend, at the local liquor store I was briefly distracted by a brandy or wine named ‘Caballero’ (can’t find on the Internets): I’m not sure if it was the brand name or the name of the drink itself, but, it reminded me of the other brand name of cigarettes made by a Dutch cigarettes manufacturer, then called ‘Sigarettenfabriek Ed. Laurens B.V’. The company was eventually bought out by British American Tobacco. Their site has a rather bland portion about the health risks of smoking and genetically modified tobacco (no). Both my parents smoked: Originally, my mother smoked Caballero cigarettes I believe and then switched to ‘Belinda’ cigarettes, which, as you can tell, were cigarettes solely targeted to females. My mother eventually quit smoking (cold turkey I believe) and the images of “the mexican on his horse” cigarette packs slowly faded away from my memories and probably (as the brand doesn’t appear to exist anymore) from the minds of continental Europeans. This entry was posted in xsamplex and tagged cigarettes on May 30, 2010 by Arthur. I f you look close to the right, you’ll see a can. An ordinary aluminium can. It could have been a photo of a Coca-Cola can. A photo of a recycled Coca-Cola can. Or a regular steel/metal food can for that matter. You’ve probably seen hundreds types of cans in your whole life. Some cans are used to store vegetables. Some cans are stored to use precious liquids, scented oils, Plumtree’s and cat food. Some cans flew off the production line in a metal packaging plant. Some of them never did. Some of the cans did not meet the stringent quality specifications and in turn were stored elsewhere for recycling purposes. They would have been stored in large carts, hauled or carted away by machinists/operators who incidentally may have worn dark blue overalls. Most likely these operators would have been wearing earplugs, as to protect their ears from the noise of cans being pulled, pushed and belted through presses, sorters and painting machines. And it’s particularly that clicking high pitched metallic noise that these people would remember if they’re presented with a can like that can shown above. It’s a fairly noisy can, so to say. This entry was posted in xsamplex on May 23, 2010 by Arthur. One of Brooker’s ‘Screen wipe’ episodes reminded (a whole playlist on YouTube) of the many nuclear war shows (fiction and documentaries) that were shown in the Eighties in West European countries. Some of the shows I’ve mentioned here before. Most memorable was ‘The Day After’ and that only because it was shown in school to either scare us or scare our enemies. Remarkably, I don’t remember ever getting training in school about how to proceed during and after nuclear explosions but the most stinging reminder of the constant threat were the monthly (weekly?) noon test sirens. Some events that seem to tip the balance to an all out war were the election of Ronald Reagan (relations between the west and the USSR started to cool down, the start of the rhetoric), the massive demonstrations against cruise missiles in West Europe and the arms race, with most notably, the ‘Star Wars program’. I also remember the apparent sudden deaths of all these Russian leaders and the moment that Gorbachev was elected as the supreme USSR leader (Reykjavik summit). From then on, the Cold War slowly faded away to the background. Thinking back, or rather, being reminded of those Eighties, brings up so many memories of events that heightened the threat level, that I wonder if we would have been prepared for an all-out war. Unlikely, I guess: and maybe as a young kid, it was probably a good idea not to think and worry about this. This entry was posted in xsamplex and tagged Cold War, Eighties, Nuclear Fallout on January 31, 2010 by Arthur. Convendro: I’ve never liked WinFF and knowing that it’s just a front-end of the almighty ffmpeg (earlier on xsamplex), I thought it was time to write something myself. I eventually moved the code to Google Code, mainly because I couldn’t get myself to touch SourceForge again. I’ve seen people using my code as a reference for extracting data from ffmpeg’s (error) output. Interesting to see how that piece of code eventually spread over the Internets. It’s also interesting to find out how 3rd party software listing sites have been hosting the main installer. As a word of caution, the official means of distribution is via Google Code. At one time we were back in Truro, NS and it felt like returning to a place where time has stood still. Every time I returned to Deventer, The Netherlands, I had that same sort of feeling. I’d never thought I would get so attached to a dog. This is particularly significant knowing that as kids we never really had pets (as in cats or dogs). I’m pretty certain my dad didn’t mind dogs (and obviously, he seemed to have had his share of dogs when he was younger) but I guess, there was never room for pets in our parental ‘enclave’. Katy the Wunderdog died at age 18, which is an amazing age for a dog. Every time the identical other makes it over to Canada, it always appears to be time for putting everything on the back burner and do some recharging. So, 2010, then. It will probably be like one of those other years (2007, 2008, whichever), with hopefully (and I say this every year) more programming to be done. Maybe less writing. Who knows. This entry was posted in xsamplex and tagged convendro on January 9, 2010 by Arthur. The weather has been fairly mixed the last couple of weeks and the only word that correctly describes it is the Dutch word ‘onstuimig’. At least I find there is some consistency: the weather is fairly unpredictable. Last week, I wanted to mentionthe attack on the Dutch royalty in the town Apeldoorn but ended up being too busy to even bother. I’m not sure why someone would attempt an attack on the royal family: It’s not that they’re hated nor would I say that Dutch people are proud royalists. I gleefully found out that major news outlets correctly described Apeldoorn as a ‘town’ and not as a ‘city’. If I remember correctly, the number of residents living in Apeldoorn is approximately 1,001 (+/- 153,000). I have good memories of Apeldoorn, but honestly, I don’t remember seeing a lot of the town itself: it’s not really a city with a notable past or significant landmarks, except for the royalty’s Summer residence, Palace ‘Het Loo’. The royals, who were unharmed, watched in horror as the car ploughed into bystanders in Apeldoorn, about 90km (56 miles) east of Amsterdam. Dutch people frown on these kind of quotes and that is mainly because the distance between Amsterdam and Apeldoorn is considered to be fairly distant (so to say). From a North American view, 90 kms is just a stone-throw away. Foreigners who have driven on the highways over here can attest to that. This brings me to a silly anecdote from 2005, when my dad visited us when we still lived in Nova Scotia. We decided to drive around, go south to Lunenberg and then hit the highway 10 to Annapolis Valley. After returning home, I jokingly asked him to point out the route we took. He was 100 percent certain that we had driven all around the Nova Scotian coast and it took me a while to convince him that we’d only seen probably half or less of it. It then finally dawned to him how small The Netherlands actually is. This entry was posted in Saint John NB, xsamplex and tagged Nova Scotia, Saint John, The Netherlands on May 8, 2009 by Arthur. Oh yeah: I happened to walk downtown and found a couple of Roll Up The Rim cups laying around, which effectively means that that specific time of the year has arrived. 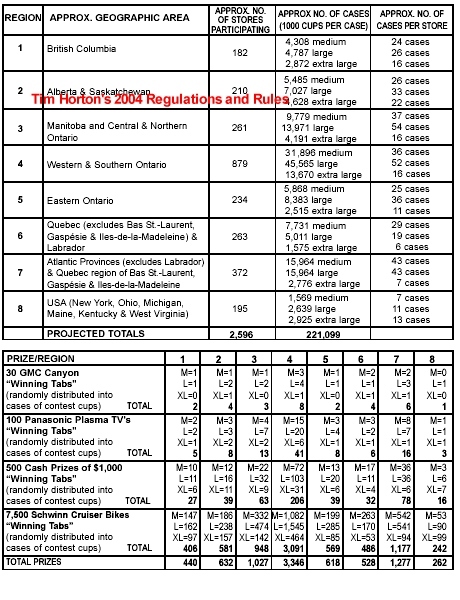 So, yeah, the contest rules are right above (or on the right side, depending on your geographical location), they are there once again (notice that the Tim Hortons site still has the year of 2008 in its title tag). No breakdown of winning cups per size this year: the numbers don’t look really appealing either (open these two in separate tabs: 2008 and 2009). 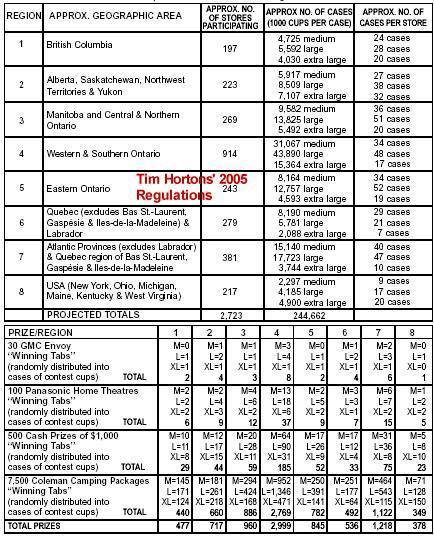 BC, Ontario and the Atlantic provinces are the losers in the amount of winning cups, Ontario leading the pack. Alberta and that area north, south, west and east of Tikrit Calgary is the big winner this year: it looks like we see the same pattern as last year (Both Quebec and the US once again are winning out here). Be advised: If you recently moved away from Nova Scotia to, lets say, New Brunswick, just to get a bigger chance in winning something, you’ll be disappointed. New Brunswick is considered part of the Atlantic region. This is a a lame attempt to make a joke. Thanks. 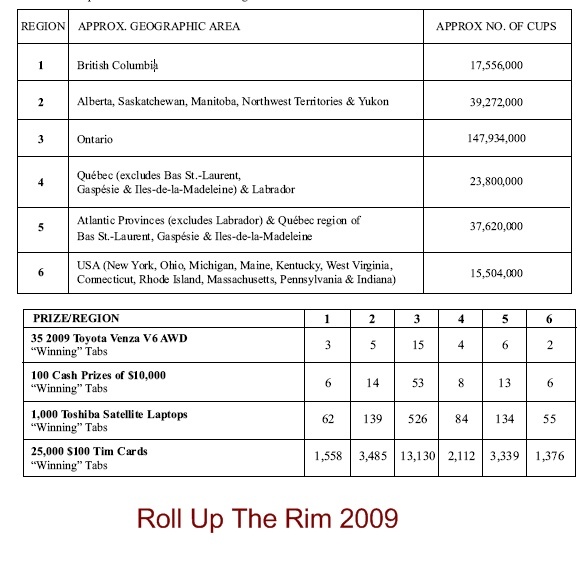 The actual prize distribution hasn’t really changed either: I find it funny that the price this year is a Toyota Venza AWD V6 (obligatory link to Toyota): Since 2006 Hortons opted for Toyota cars as the first prize. Maybe that’s telling. This year (“The Year of the Ox”1), cash prizes seem to be the preferred choice and yes, Toshiba laptops. These are not overly expensive laptops and they carry that boring T3400 processor: However, Toshiba is so happy to be part of the Tim Hortons Roll Up The Rimmm-uh-whatdoyoucallit, that the laptop comes with a special sleeve (obligatory Toshiba link. with photo of sleeve). You’ll look so hot when you bring that to school. Who’s bringing the donuts today? 1 The Year of the Ox has of course nothing to do with the topic. I just brought it up for no particular reason. Get it? Previous entries: 2008, 2007, 2006, 2005, 2004, 2003 and 2002. 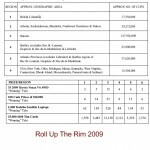 Or click this tag for all posts tagged with ‘Roll Up The Rim’. 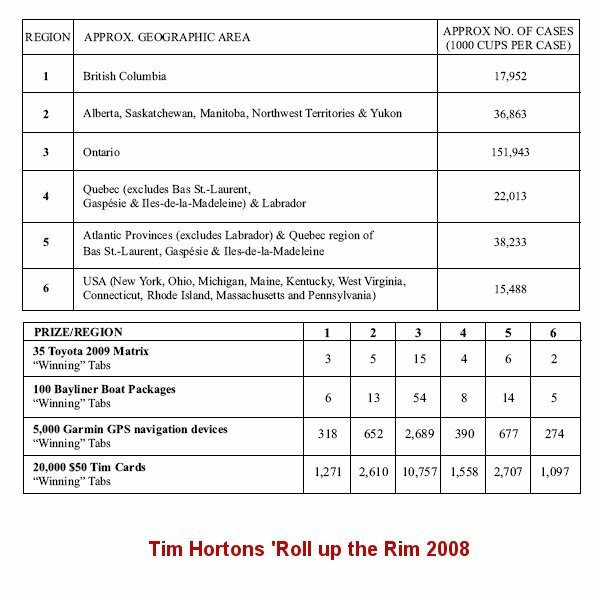 This entry was posted in xsamplex and tagged Roll Up The Rim, Saint John, xsamplex on February 28, 2009 by Arthur. A couple of days ago, I was watching Planet Earth (BBC’s award winning documentary) and I noticed one of the documentary’s crew member trying to though out a can of sardines (see photo). We used to eat that stuff too, that is, on white bread and that. I don’t recall seeing it too often in our kitchen, so I wonder if it was (regularly) part of my dad’s yearly ‘Christmas package’1. It’s not that bad as it looks like. Seriously. I have been running Windows Vista (64-bit, represent!) lately (the last three months or so) and don’t have really much to complain about except for that, yeah, it doesn’t run some of my old stuff (Delphi 7) and it generally feels ‘unorganized’ or ‘inconsistent’. My biggest pet peeve is Vista’s Reliability Monitor: its concept makes totally no sense. What is that saying again? Lies, damn lies and statistics? A couple days ago, I marked ‘Fandro’ as a legacy project. I have not looked at the program’s sources for months and I’m not even sure if I still remember how it exactly works. I’m currently considering in changing the license for the program, provided that I can find a way to properly clean up the code and that. After all, my Delphi 7 copy doesn’t run under Vista 64. I’ve been steadily working on Convendro (my FFMPEG front-end). I was planning to do some extra stuff this weekend, but decided against it and started up cleaning and reorganizing the code. There are still some open things I have to set my brains on: for example, I’m considering supporting other encoders, which will require changes to the way some of my Preset objects work. But yeah, I’ve been converting older avi files to mp4s (for my iPod Touch), just to see how it holds up against WinFF, Videora and others. 1 During Christmas, Dutch employers give their employees a box of ‘goodies’. This entry was posted in xsamplex and tagged canned stuff, convendro, fandro, sardines, Windows Vista on February 15, 2009 by Arthur.